Why did I get this book? 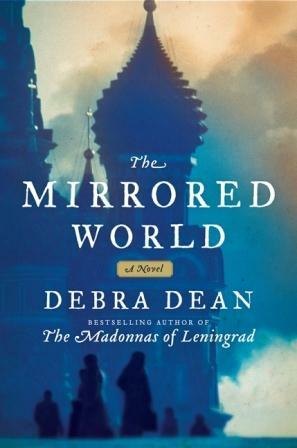 : I've heard nothing but great things about Dean's previous novel, The Madonnas of Leningrad, so I couldn't pass this one up. Review: I have a soft spot for saints. Novelists who tackle the life of a saint -- what they might have been really like -- automatically endear themselves to me, and I was drooling with anticipation over this book. Happily, Dean didn't disappoint, and this brisk little novel has the lush extravagance I wanted from a historical novel featuring royalty as well as the more mundane details of everyday life. Beginning in the 1730s, the story is told by young Dasha, who is mesmerised by her older cousins, Nadya and Xenia. While Nadya is cold and cruel, making a flawless debut into St. Petersburg society, Xenia is dreamy, impulsive, and impractical -- and yet, she makes a successful love match. When tragedy strikes, Xenia's wild exuberance manifests as a discomforting disregard for herself, her property, and her place in society. I loved this book from the first page -- Dean immediately sucked me in with her sweet narrator, Dasha, and her complicated cousins. Dean juxtaposes the real cruelties of life -- heartbreak, disappointment, loss -- against the historical ones of the era -- like the Empress' cruel mock marriage of her young jester to an old maid that required them to spend their wedding night naked on a bed of ice in a massive ice palace. What else should I squee about? I raced through this book because I didn't want to leave Dasha, Xenia, and even Nadya, and I was fascinated -- and horrified -- at this look at royalty. (That Empress Anna -- she was a cruel one!) Dean's writing style is effortless, a little pretty, a little detailed, so that mood and place are evoked easily. I'm thrilled to offer a copy of The Mirrored World to one lucky reader! To enter, fill out this brief form. Open to US/Canadian readers, ends 9/14. I love reading books set in Russia. It is actually a sort of exotic locale for me. I have seen this one popping up and the cover is gorgeous. Thanks for the review.and giveaway. You'd love this one -- Dean managed to evoke 18th century St Petersburg but this isn't a big chunkster -- it is pretty impressive how she did it. I was captivated from the start -- I can't gush enough -- so do give this one a try if you like Russia as a setting. I don't believe I've ever read a book set in Russia -- which is especially strange considering my Russian roots! (Well, Russian and . . . about a million other things. I'm a European Heinz 57 of ancestry.) This sounds like a fascinating story, and I love the idea of following a group of cousins through the time period. Oh, well, this is a good one to debut with as it highlights some of the insane lavishness of the Russian court at the time, intense, wild landscapes, and some fabu characters. I'm envious of your Russian roots, however Heinz-y muddled they may be, too! I don't know that I've ever read anything set during that time/place. This book sounds wonderful! Kathy, I can't rave enough -- it has all those elements of a fabu hist fic -- the people, the place, the strong sense of era -- and I found Dean's articulation of a woman-turned-religious figure to be very resonant and real. I want. TOTALLY stoked to read this one! I am reading this one for the tour as well, so I am excited about it! I love a good historical fiction novel that is set in a place that I know little about, so I am confident that this is the one for me. Thanks for your enthusiastic and insightful review. I can't wait to get to this one! I'm looking forward to your review -- I was just soooo enamored of this one! I finished this one last week, I liked it but not as much as you did. I would have preferred to read more about Xenia, I found Dasha rather boring. Ooh, I'll look for your review! I thought Dasha was a good foil for that reason -- anyone full of themselves and their life -- like Nadya -- might have been quick to write Xenia off -- Dasha's obvious admiration/adulation of her cousin is why, in some ways, she remained so devoted to Xenia. It worked for me, at least! This book was on my wishlist already (historical fiction? Russia? I couldn't resist!) but now I am even more excited to read it! Until my library gets a copy, I might hunt down the Madonnas of Leningrad. I know, I'm hot to find Madonnas as well. If you like Russian hist fic, I highly recommend Kathryn Harrison's Enchantments -- its about Rasputin's daughter! This sounds SO GOOD! I haven't read anything by this author before but this sounds like a great place to start :). Thanks for the recommendation, I have added it to my ginormous wishlist! Yes -- I whole-heartedly recommend this to start -- just marvelous! Anna has already been raving about this book in my ear...and she hasn't even posted her review yet! I must read this book...if both of you love it! Wow! This sounds great! I love Russian HF. I am going to have to read this one for sure. I'm reading CATHERINE THE GREAT now and am loving the opportunity to learn more about Russia. There is just so much to learn. The Madonnas of Leningrad has long been on my TBR list as well, and apparently I should add this book as well! So glad you loved it. Thanks for being on the tour! I just finished this book last night (my tour date is next week) and I loved it, too! You really should read The Madonnas of Leningrad...another winner! This one sounds intriguing. I always like books set in another culture. Thanks for the giveaway.